Take a kid fishing!! It is fun! Steve brought his 12 year old grandson Jaxon down to the Keys for his first ever salt water fishing trip.. Might be his first but certainly not his last.. Jaxon had a blast sight fishing to sharks.. blacktips, lemons and bonnet heads.. First day, first shark was a 7 foot blacktip hooked in less then 3 foot of water.. 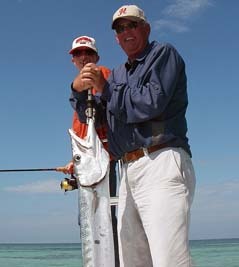 It was fun..
Jaxon and Steve with Jaxon's first cuda. 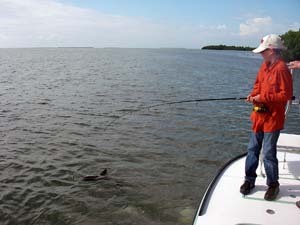 Later we switched to sight fishing cudas.. It is that time of year and these tanker cudas are starting to show up on the flats.. Jaxon did a great job feeding this cuda.. 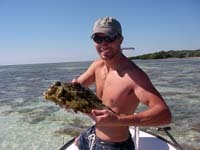 Most unusal catch of the month.... We got this box fish while looking for bonefish on an ocean side flat.. Speaking of unusual, It has been a strange October. NE winds just about every day for weeks.. 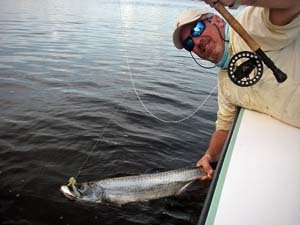 Still finding bonefish, permit and juvenile tarpon.... Some days we are having to work harder to find them.... but we are finding them..